Memorial Day is fast approaching – the sunny holiday which ushers in the summer season, lots of grilling, time at the seashore, and – for me – clam chowder. Blame it on my New England roots, but slurping down a bowl of steaming hot, buttery rich chowder is right up there with building sand castles and smearing on sunscreen when I think of summer. 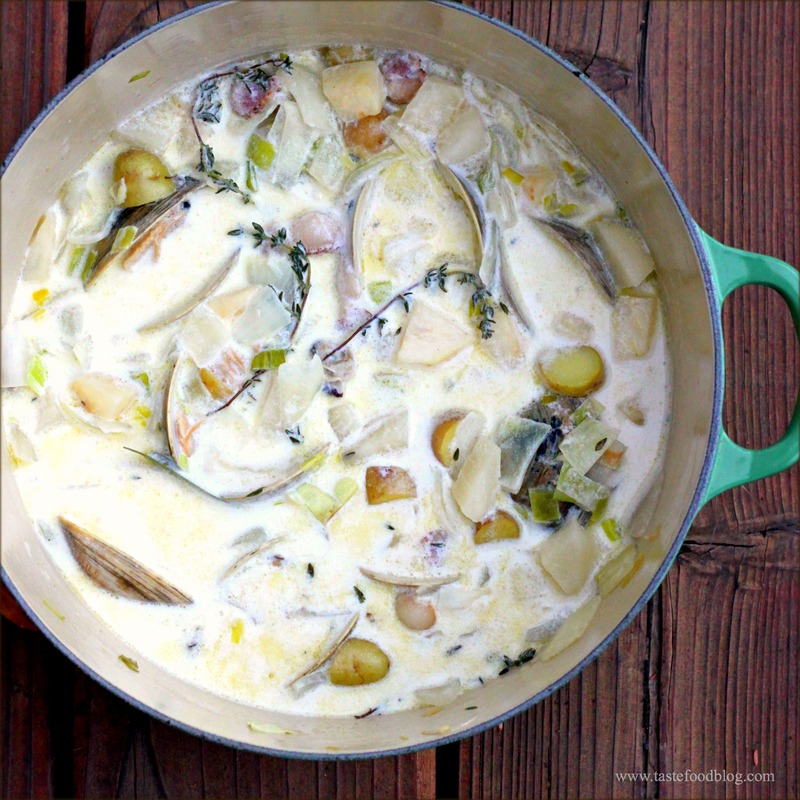 Chowders are actually quite easy to make, a simple concoction of milk and cream, potatoes, and clams. 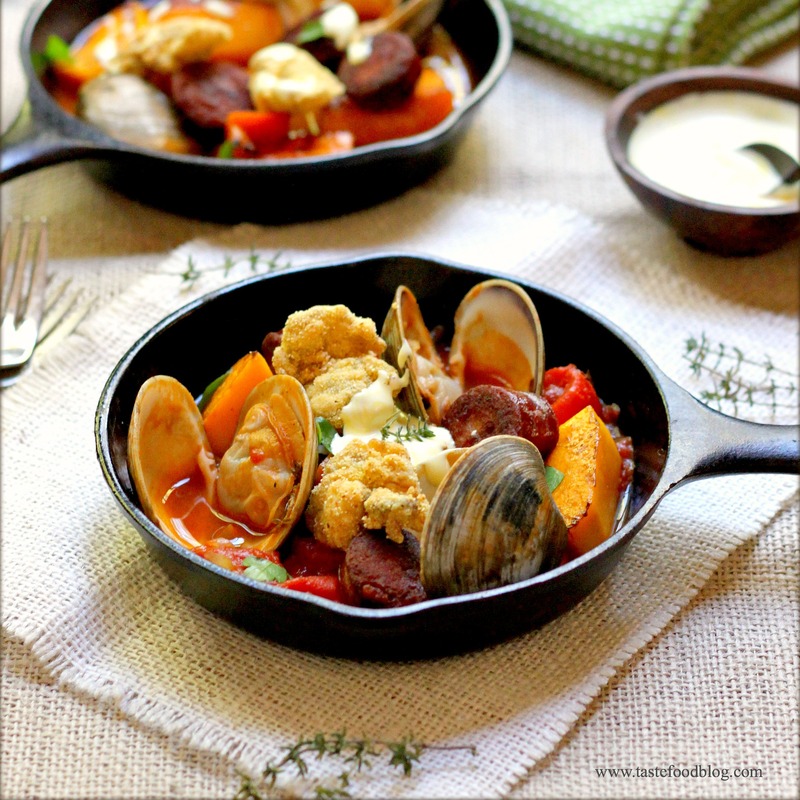 If you are not feeling the clams, you can add firm fleshed fish such as salmon and halibut and call it a fish chowder. The key is to get a smoky base to the soup with bacon (or in fish chowders, I’ll add warm-smoked salmon), and a little thickness with a roux (which is simply a little flour mixed into the fat from the bacon) and have fun with your vegetables. Potatoes and onion are standard, and I often add leeks or mild root vegetables, such as celery root, or even spinach. When you are selecting clams be sure to choose the smallest you can get your hands on, such as little necks, middle necks, or, if you are on the U.S. west coast, manila clams. Fry the bacon in the oil in a large pot over medium heat until the fat is nearly rendered. Add the onion and leek and sauté until softened, 3 to 4 minutes. Sprinkle the flour into the pot, and cook for 1 to 2 minutes, until very lightly colored, stirring constantly. Whisk in 1 cup of the stock, stirring to blend the flour. Add the remaining stock, the potatoes, milk, cream, bay leaf, and thyme. Bring to a simmer, partially cover and cook until the potatoes are tender, about 20 minutes. Add the clams, partially cover the pot and simmer over medium heat until the clams open, stirring occasionally, 6 to 8 minutes. 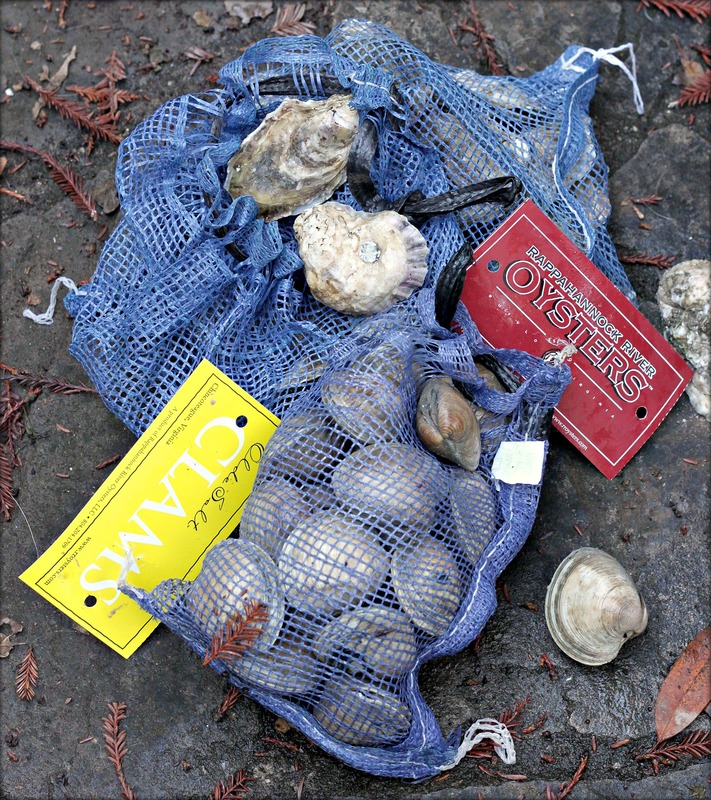 Discard any unopened clam shells. Season to taste with salt and pepper. Serve hot garnished with fresh thyme. Here’s a fresh twist on the classic shrimp cocktail. Rather than dipping poached shrimp in a spicy tomato sauce, how about dipping grilled shrimp in a garlicky pea purée? I like to make this pea purée when sweet peas are in season. It’s an incredibly versatile condiment. Not only is the purée a perfect garnish to sweet and briny shrimp, it tastes great with other seafood such as scallops, salmon and halibut. It also makes a great topping for crostini, a dip for cruditées or steamed new potatoes. If fresh peas are out of season, frozen peas may be substituted. Serves 4 to 6 as an appetizer. If using fresh peas, fill a medium saucepan halfway with water (do not add salt as this will toughen the peas) and bring to a boil. Add the peas and cook until bright green in color and tender, 3 to 4 minutes. Drain and rinse with cold water to stop the cooking process. Transfer to the bowl of a food processor. Add the remaining puree ingredients and process to blend. (If using frozen peas, skip the first step and add the peas with the remaining ingredients to the food processor and process to blend). If purée is too thick, add more olive oil to achieve desired consistency. Taste for seasoning. Whisk all of the marinade ingredients in a large bowl. Add the shrimp and turn to coat. Refrigerate for 30 minutes. Prepare the grill for direct cooking over high heat. Thread shrimp on skewers. Grill over high heat with the lid closed until just cooked through, turning once, 2 to 4 minutes. 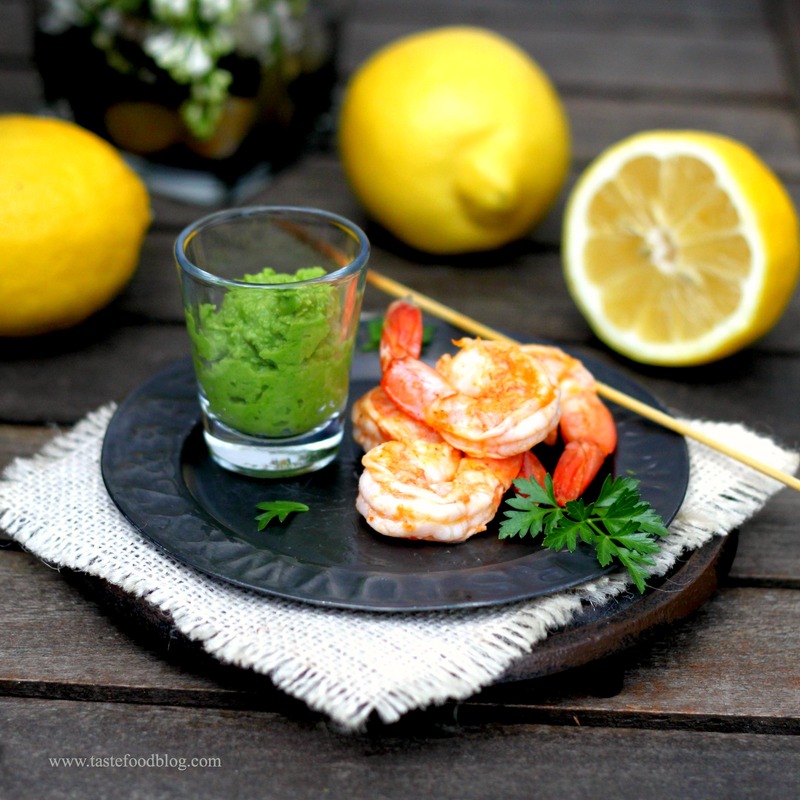 Serve the shrimp warm with the pea purée for dipping, or spoon dollops of the pea puree over the shrimp. Nothing beats a fresh and bright bowl of pasta, whipped up in less than 30 minutes, for an easy weeknight dinner. 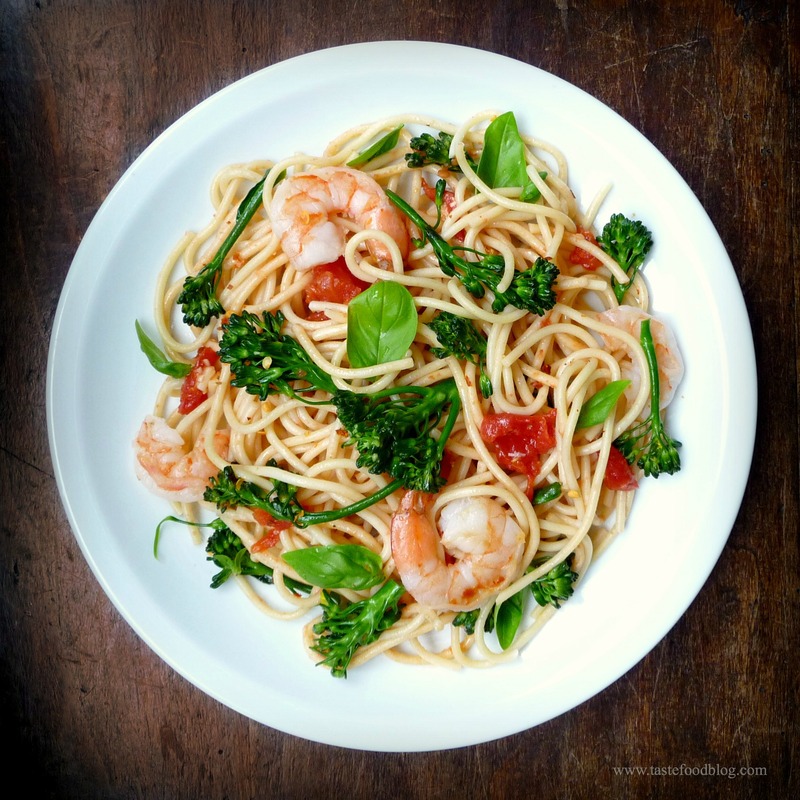 This dish has it all: Crisp tender broccolini and sauteed shrimp tossed in a simple tomato sauce flavored with basil, garlic and chili. It’s elegant, light and utterly delicious. Happy Monday! Bring a large pot of salted water to a boil. Add spaghetti and cook until al dente. Drain and transfer to a large serving bowl. While the pasta is cooking, heat one tablespoon olive oil and a pinch of red pepper flakes in a skillet. Add broccolini and sprinkle with 1/2 teaspoon salt. Sauté until bright in color and crisp tender. Transfer broccolini to a plate. Add 1 tablespoon oil and 1/2 teaspoon red pepper flakes to same skillet. Add shrimp in one layer, in batches if necessary. Cook until pink on both sides and just cooked through, 2-3 minutes. Transfer shrimp to another plate. 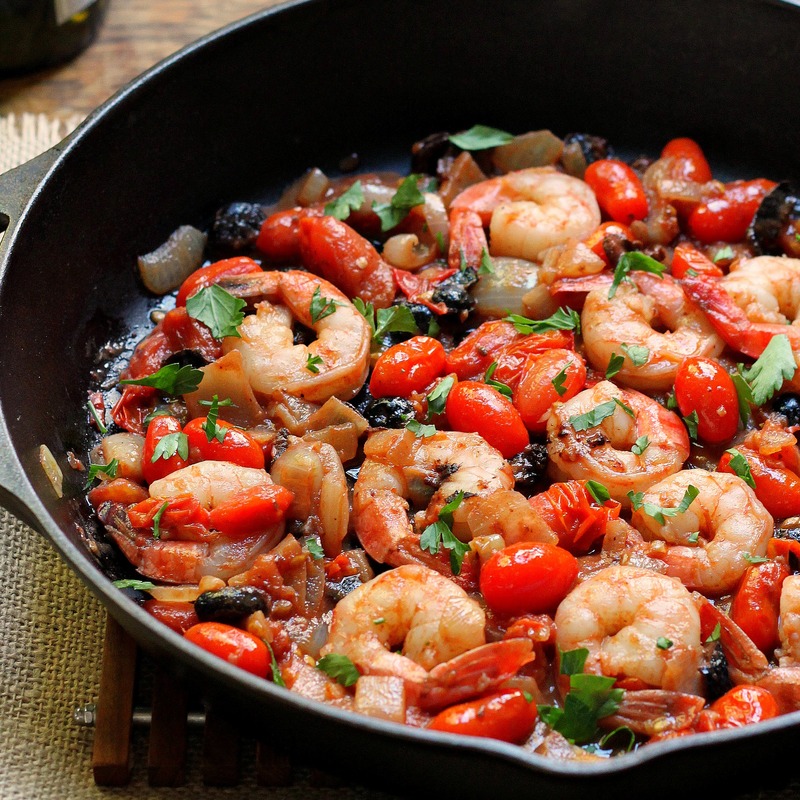 Add 1 tablespoon olive oil to skillet. Add garlic and sauté until fragrant, 30 seconds. Add tomatoes, one teaspoon salt and 1/2 teaspoon black pepper. Simmer 5 minutes, breaking tomatoes apart with a spoon. Taste for seasoning and add a teaspoon of sugar if needed. Add shrimp, broccolini and tomatoes to the spaghetti. Toss to combine. Add basil and toss again. Divide among serving plates. Grind more pepper over the pasta and sprinkle with cheese if using. It’s not often, er, ever, that I receive a box of East coast shellfish delivered to my California front door – that is until 10 days ago when a special delivery box arrived with 4 dozen pristine oysters and middle neck clams from Rappahannock River Oysters in Virgina. They were as fresh as could be, cold and moist, smelling of seaweed and sand. A taste of the East lay at my feet. This was simply not fair. While I now live in California, and before that called Europe my home, I am a New Englander at heart. And I miss it. This is evident by how I gravitate to environments and sensations that remind me of a place I haven’t called home since 1991. I crave 4 distinct seasons, and reminisce wintry blizzards, humid summers, and the smell of fallen leaves with chimney smoke hanging in the air. I seek vignettes suspiciously similar to a traditional New England setting, old structures and neighborhoods steeped in history, creaking with wood, lined with cobblestones. And the sea must never be far away. Nothing epitomizes New England to me more than the seashore – especially on a chilly foggy day laden with mist, with the cries of seagulls and the clanging of buoys punctuating the sound of the wind and waves. So there I was, a week ago, with 2 nets of memories before me in the form of shellfish, still moist from their beds, gritty with sand, smelling of brine and salt. 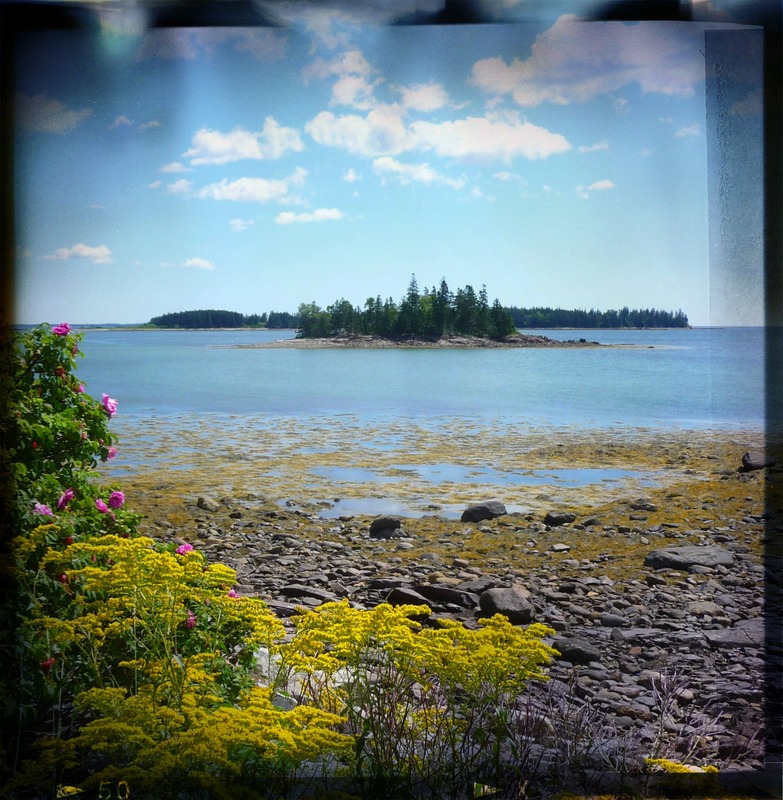 It transported me to New England, and I knew that I would have to do them justice. I headed to my kitchen – the heart of our family home and life, no matter the coast or the country. The place where I go to recreate memories, carry on traditions and evoke sensations of time and place. The oysters and clams were ridiculously fresh, and I knew I had to get to work fast. (OK, I admit a few oysters were instantly slurped straight up with a squeeze of lemon and dash of Tabasco. Hey, you would’ve too). 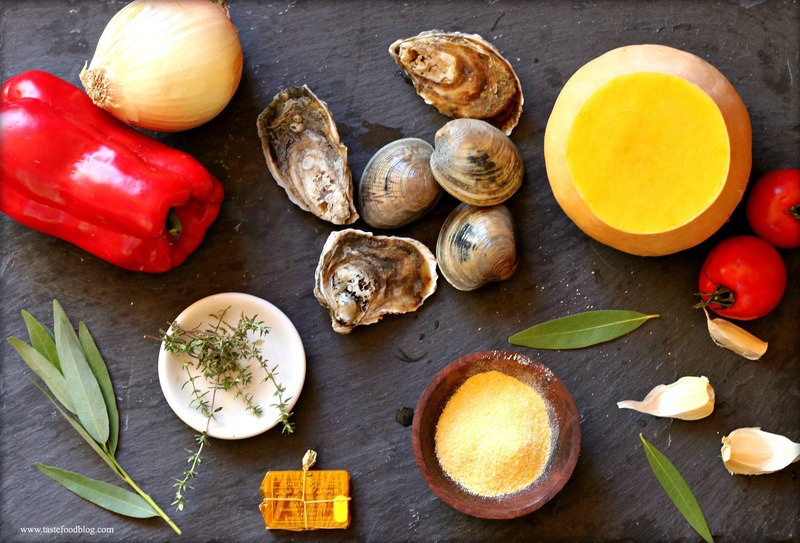 I thought about how to create one recipe showcasing both oysters and clams, drawing inspiration from the East coast, while embracing my adopted West coast sensibilities – with a touch of the Mediterranean. I am a fan of chowders and cioppinos, and I decided on a stew, with layers of flavor and texture. It’s autumn after all, the season of layers – layers of clothing, layers of bedding and layers of nourishing, sating ingredients in our meals. Each ingredient would stand out yet complement the whole of the stew, with a balance of sweet, smoke, heat and brine. I addressed each ingredient separately before uniting them, taking care to prevent a muddle. I browned the chorizo slices first for color and flavor. They would be added to the stew in the end, preventing softening and loss color by overcooking in the soup. Their legacy, the flavorful oil, remained in the pot infusing the stew with heat and smoke. I sautéed planks of sweet butternut squash in the oil. This step ensured the squash were thoroughly cooked and slightly caramelized. The chunks would be added in the end, like the chorizo, avoiding excessive mushiness and preserving their brilliant saffron color. Roasting the red pepper coaxed out its natural sugars and imparted another layer of smoky flavor to the soup. The clams cooked in the stew, opening and releasing their briny juices in the stock. Finally, I fried the oysters, first soaked in buttermilk and Sriracha, then rolled in cornmeal, ensuring super-crispy results with a playful bite. They would garnish the stew as a riff on croutons one might add to a Mediterranean seafood stew with a definite nod to the American south. A spoonful of saffron scented aioli added a creamy finish to the soup with the kick of heat. Whisk together all of the ingredients in a small bowl; set aside. Place the oysters in a small bowl. Whisk buttermilk and Sriracha in a separate bowl. Pour over the oysters to cover and set aside. Whisk the cornmeal, flour, salt and pepper together in another bowl and set aside. Heat 1 tablespoon olive oil in a deep skillet over medium-high heat. Add sausage slices, in batches, and brown on both sides, turning once. Transfer to a plate lined with a paper towel. Add the squash, in batches, to the skillet and pan fry until golden on both sides, turning once. Pour off all but 1 tablespoon oil from the pan. Add 1 tablespoon olive oil and onion. Sauté until softened, about 2 minutes. Add red pepper, garlic, paprika and red chili flakes. Sauté until fragrant, 1 minute. Add wine and deglaze the pan, scraping up any brown bits. Add tomatoes, bay leaf and thyme. Simmer, uncovered, until somewhat thickened, 15 to 20 minutes. Add clams. Cover pot and cook, shaking occasionally, until clam shells open, about 10 minutes. (Discard any unopened clam shells). Add salt to desired taste. 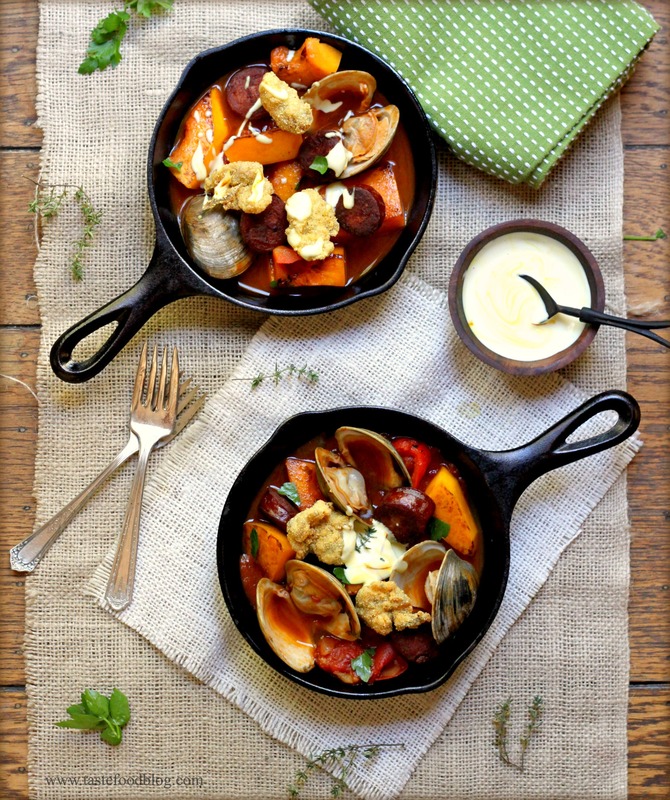 Ladle the stew into warm serving bowls. Top each bowl with 4 oysters. Spoon a little saffron aioli into the center of the soup. Garnish with parsley. Serve immediately.